And how come regular olives go in a jar but black olives are stuck in a can!? I say almost, because in reality it worries me. If someone looks at this advert and sees skin colour, creed or race, I would suggest they are the ones with the problem. I see a cookie. And a visual metaphor/simile for biscuit and chocolate getting on with each other. That's all. I saw that ad a week ago. I'm not sure what the racist aspect of the ad is supposed to be. It's a cookie and chocolate--a blending in the manner of peanut butter and chocolate (Reese's). The logic, like the art direction on the site, makes no sense whatsoever. They should change the name of the cookie from "Milano" to "Mulatto"
Wouldn't an all chocolate cookie be more racist? This looks like an integrated cookie to me... Though, the black chocolate is being oppressed by the white cookies surrounding it. But with Oreos, it's just the opposite! Wait, maybe it's sexist, since they made the girl dancer out of chocolate. 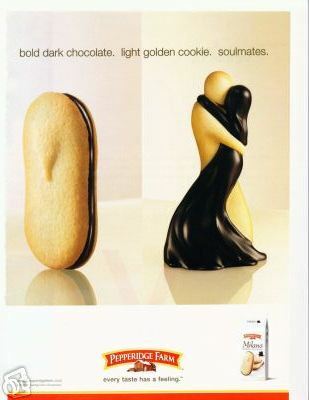 At any rate, I'm offended by this cookie ad... for some reason. If Rev. Al Sharpton viewed this ad, he would undoubtedly holler, �Where can I get some of those delicious-looking cookies? !� Then he�d eat the entire bag in a single sitting. This reminds me of the time Bob Garfield took offense over an Oreo cookies campaign that integrated (pun intended) Randy Jackson of American Idol. It�s just a cookie, folks. Not a cooKKKie.